14.12 Conclusion: the future of naturally sourced biomaterials? Hydroxyapatite in the form of hydroxycarbonate apatite is the principal mineral component of bone tissue in mammals. In Bioceramics, it is classed as a bioactive material, which means bone tissue grows directly on it when placed in apposition without intervening fibrous tissue. Hydroxyapatite is hence commonly used as bone grafts, fillers and as coatings for metal implants. 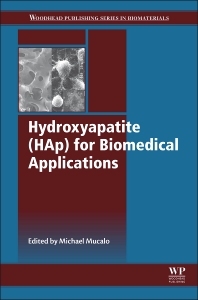 This important book provides an overview of the most recent research and developments involving hydroxyapatite as a key material in medicine and its application. Researchers and developers in industry and academia who are interested in biomaterials, tissue engineering, drug delivery and coating applications. Dr Michael R, Mucalo is Senior Lecturer in physical Chemistry at the University of Waikato in New Zealand.